Let LED Blinker Notifications show your missed calls, SMS and Gmail messages. If you have no hardware led, the screen is used. All apps are supported in the full version. It is possible to remove the ADS (see the button at the top or at menu) but you WON'T get the FULL VERSION! This app, which ist created in material design, is very simple to use and not much configuration is needed! 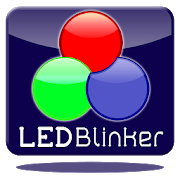 AndroidHeadLines: 'LED Blinker is an Android app that aims to make it much easier to help you figure out which notification is which'. Unlike other apps in this category you don't need 'ROOT' access to use LED Blinker and this app is very battery friendly! The new right to write to SD card it needed for error reports (check menu extras: Debug mode), please send it to mosoft.android@gmail.com if you have found an error.